Next story in Cold and flu Bird flu, pig flu, now bat flu? 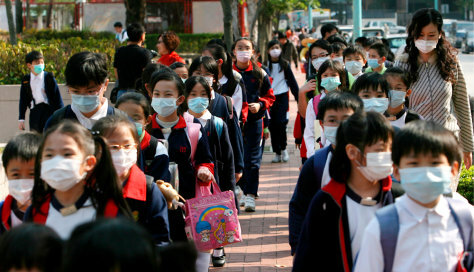 Pupils and teacher wear masks at a primary school at Yuen Long district in Hong Kong. Institutional outbreaks of influenza fear escalates in Hong Kong, with two schools closing early for the Easter holidays after a 7-year old boy died.